July is already upon us, which means that it’s only a little over a week before Theatre Under the Stars begins previews of its 2009 season. TUTS has made some shrewd choices this year with a duo of family-friendly shows; classic crowd-pleaser Annie and the relatively new but very popular Thoroughly Modern Millie. I’ll be posting further about both shows in the days leading up to the opening nights. TUTS has been a summer Vancouver tradition at the Malkin Bowl in Stanley Park since the 1940s with only a few interruptions. Most recently TUTS took a hiatus in 2006 after running into financial difficulties. It was widely speculated that the two lesser-known shows staged in 2005, Big: the musical and Can-Can, failed to draw in ticket-buying audiences. For the last two years, TUTS has safely steered towards popular and time-tested fare; Grease and Oklahoma in 2007, and Jesus Christ Superstar and Annie Get Your Gun in 2008. 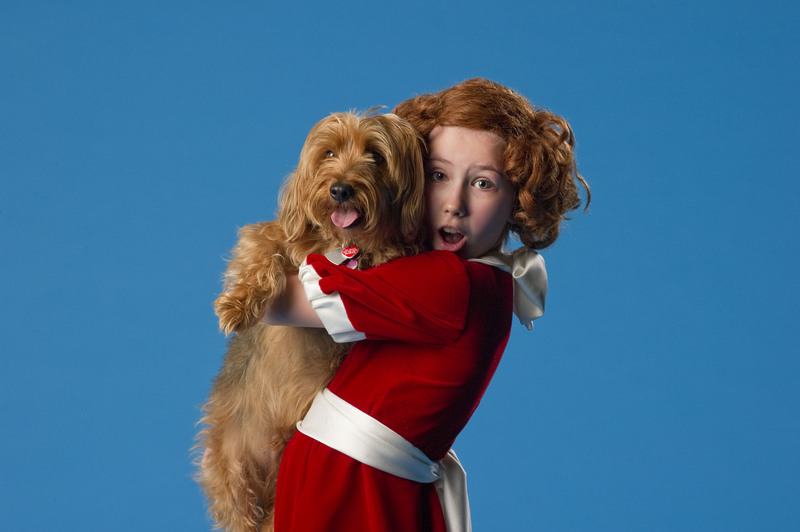 Michelle Creber and Max in the TUTS production Annie. Photo by Tim Matheson. Michelle Creber plays the redheaded optimistic orphan Annie alongside a slew of Vancouver stage veterans. David Adams stars as Oliver Warbucks, Colleen Winton (2008 Ovation award winner for Musical of Musicals the Musical, Fighting Chances), as Miss Hannigan, and Todd Talbot (It’s A Wonderful Life, Arts Club) as Rooster Hannigan. Former Vancouver Playhouse artistic director Glynis Leyshon directs. Thoroughly Modern Millie stars Broadway actress Diana Kaarina (Rent, Les Misérables) as the titular character who, in the modern tradition, moves to the big city with plans to marry not for love but for money. The role should be somewhat old hat for Kaarina, as she previously played the role in the touring company of Millie. Directed by Shel Piercy, the cast also includes Meghan Anderssen (Annie Get Your Gun, TUTS), Danny Balkwill (We Will Rock You, Mirvish), and Sarah Rodgers. Previews July 10-13. Shows play alternating nights with Annie opening July 14th through August 21st and Thoroughly Modern Millie opening July 15th through August 22nd. Tickets available online or by calling 604-684-2787.